It looks like I am getting ready to step outside into the traffic and WIND. All I hear is dumpster lids clanging and bottles breaking in the alley and church bells. Non stop church bells, they started at midnight. They ferry will be well worth the price today. I will keep you posted. That is, unless we capsize or get hijacked by a masked gunman, then I will have to do a recap. 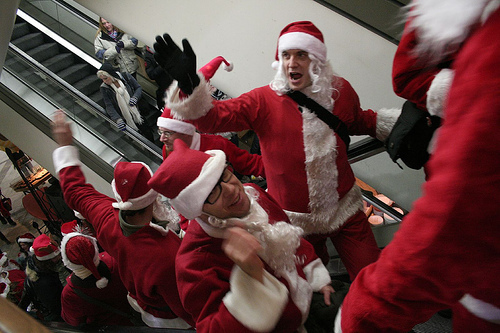 A group of mock Santas, all childhood friends, stretch out at the beginning of the annual Santarchy celebration Saturday, Dec. 17, 2011, in Seattle, Wash. Under a clear blue sky, groups of Santas waved and handed out candy along the bar route, which had commenced at the International Fountain. While some danced to the sounds of portable boom boxes carried through the crowd, others stuck to benches and barstools to watch the action. 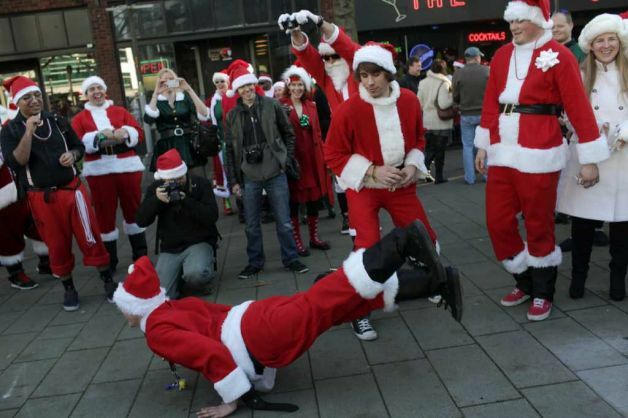 I find a large group of drunk people dressed like Santa Claus break dancing on city streets to music from boom boxes exceptionally entertaining. I also like it when they all ride escalators together at the mall, but truth be told, there just isn’t enough booze at the mall (look for my Initiative on next election’s ballot, it’s called “Gin and Julius”). Here is the entire photo galleries. What’s not to love? It is the best Christmas song ever! Next Post: Face it. You’re a neo maxi zoom dweebie. lol found your site when looking for different beer brands, dont know how that happened!